Time is fluid in Tuscany. We were to leave at 8 for our big day in the Cinque Terre (5 coastal hamlets, each with its own flavor) but we’re lucky to actually be moving by 9. The whole lot of us on this retreat are spread across 3 villas so communication is sometimes challenging. No one but our casa mates are ready. Fortunately there are other cars as well. We will meet up along the way. Six of us drive to La Spezia to catch a ferry to town hop. 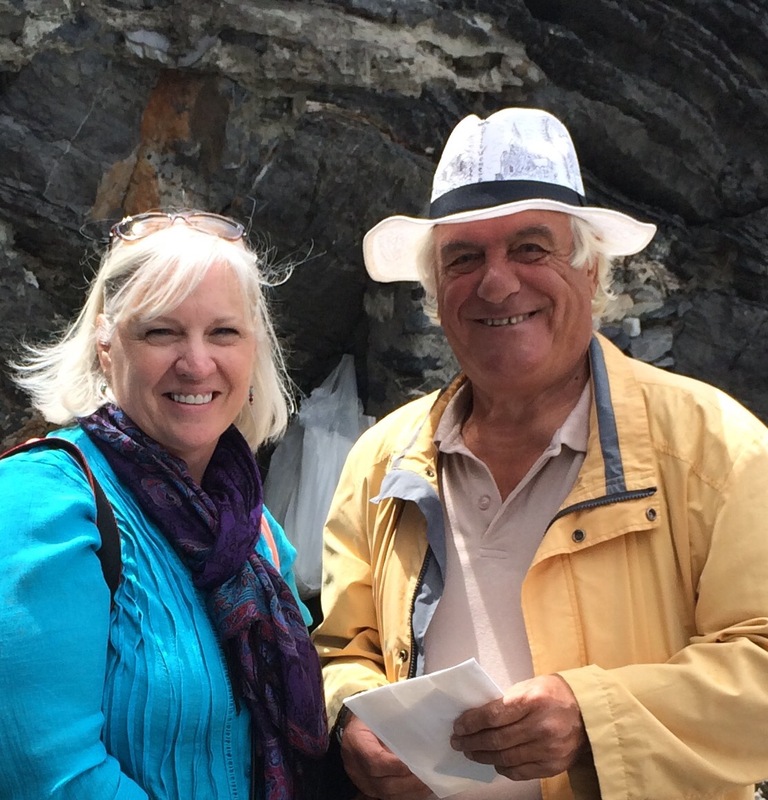 As Bill – our amazing driver and husband of our host, Deb – tries to squeeze into parking spots fit for Vespas, we search for a cappuccino dealer by the water. First things first. Cappuccino first. We’re told the ferries are not running today. Our fearless leader goes off in search of train info. There is always more than one way to do things if you really want to do them. As she disappears we sip our hot frothy drinks gazing out at the Mediterranean. It’s still sinking in, just exactly where we are. Bill finds us and informs us Deb is in line purchasing ferry tickets. We’ve stopped asking questions. On board the ferry, we are awestruck by the beautiful villages that dot the craggy hills rising from the sea. Buildings seem to be levitating just above the earth, cantilevered over the water. We can’t figure out how one might approach such a structure to visit it, let alone furnish it. Just as we create the story of how one particular neighborhood came into being we are presented with a new place. This one a fishing village we are told. The tall houses or apartment buildings are painted different bright colors so that in days gone by the fishermen could identify their own homes from the water. 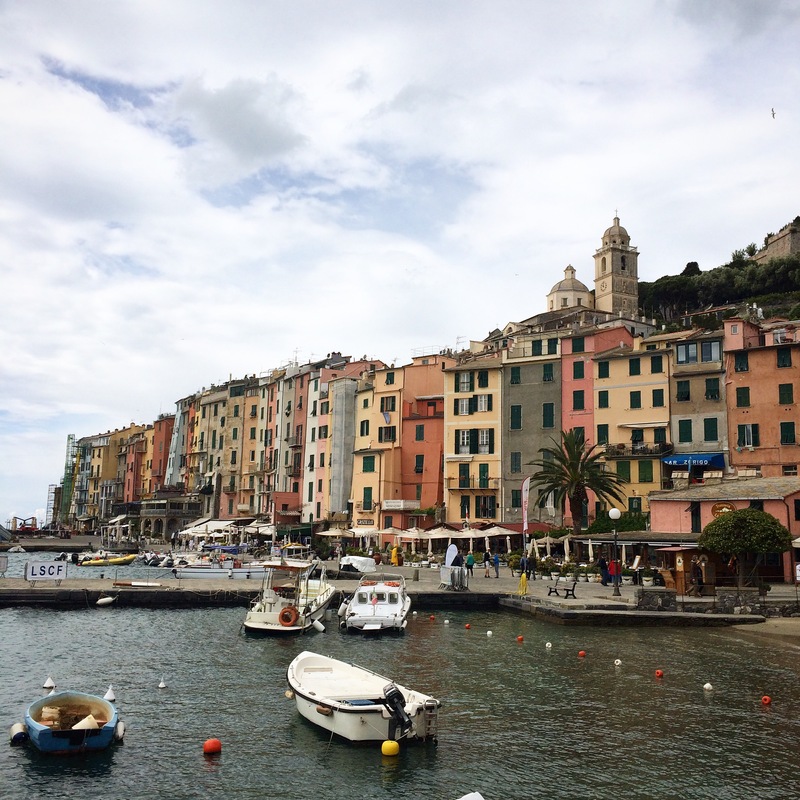 Finally we are pulling into our destination – Portovenere – not technically part of the Cinque Terre, it is an honorary member and full of history and beauty. The marina we pull into houses small brightly colored, but otherwise unadorned, individual fishing boats. There is an older man singing while painting the railing surrounding the marina. Beyond the marina and past a row of storefronts, a broad walkway is carved into the stone hill leading to an ancient church. The thoroughfare is wide enough to accommodate two cars, although at the time of its construction knights on horses in armor or great throngs of worshippers likely filled the space. This is our first destination. A tall stone wall rises on the right hand side along the walk, in it portals large enough to walk through, some gated, some smaller and taller. A hint of Mediterranean blue sparkles between bars. I’m am drawn to this window by a force outside myself. The views are mystical and magical. Almost too much beauty to behold at once. After I peel myself away, I find an opening in the rock that has something like steps leading down toward the water. 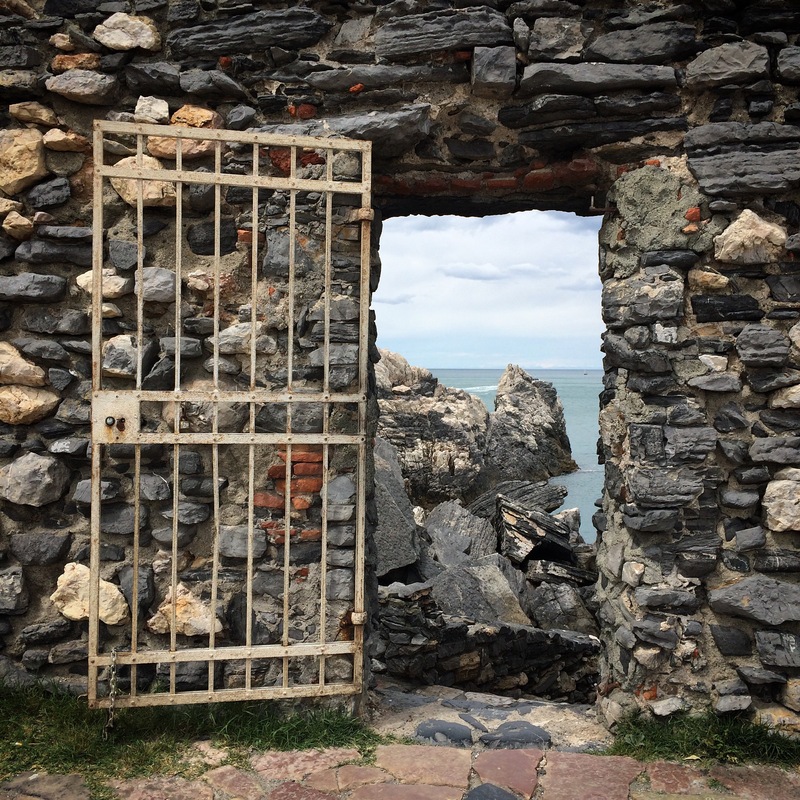 Around the first corner I spot an older Italian man painting on an umbrella with the sites he sees around him – the sea, the shape of the earth above the water, windows in the rocks. No one is with me at first so I simply stop and watch him, immersed in his craft. As others find me, I step into his area to peruse the postcard sized art he has created. It’s sweet and colorful and original. I select a few pieces and approach him. I am greeted by a weathered face brightened by a wide grin – a man established in himself. He is easy and light. I hand him my purchases and ask if I can have a photo with him. He smiles bigger and reaches first for his hat – one he has sketched all over. Mori – this is name – personally signs each painting, pointing out the inspiration for each so I have a point of reference. I am so buoyed by his presence and clear love of what he does that I find it hard to move on. But I am rewarded for my ability to separate from him by even more magical moments and views. The church itself sits at the highest peak on this outcropping. Its doors are easily 10 feet tall and have verdigris bronze sculptures of the heads of the apostles – we think – attached to it. It’s quite gothic. The handle of the door is an entire single man crawling upwards reaching for something. Inside, the church is dark and it’s clear where each period in history added its own mark. Gothic points, a crumbling mosaic on the floor, protected now by ropes and plexiglass, a bronze saint seated in an alcove receiving prayer requests cast on the smoke of burning candles. The church itself is an art history lesson. Officially consecrated in 1198, the original church was built sometime in the fifth century, updated and added onto throughout history then finally restored in the 1930s. It’s lovely, but the day is bright and the water is calling. We exit and explore further the nooks and alleyways. I hear harp music. I think it’s live. This is a very familiar sound as my mother played throughout my childhood. There’s a comfort in it so I seek out its origin. 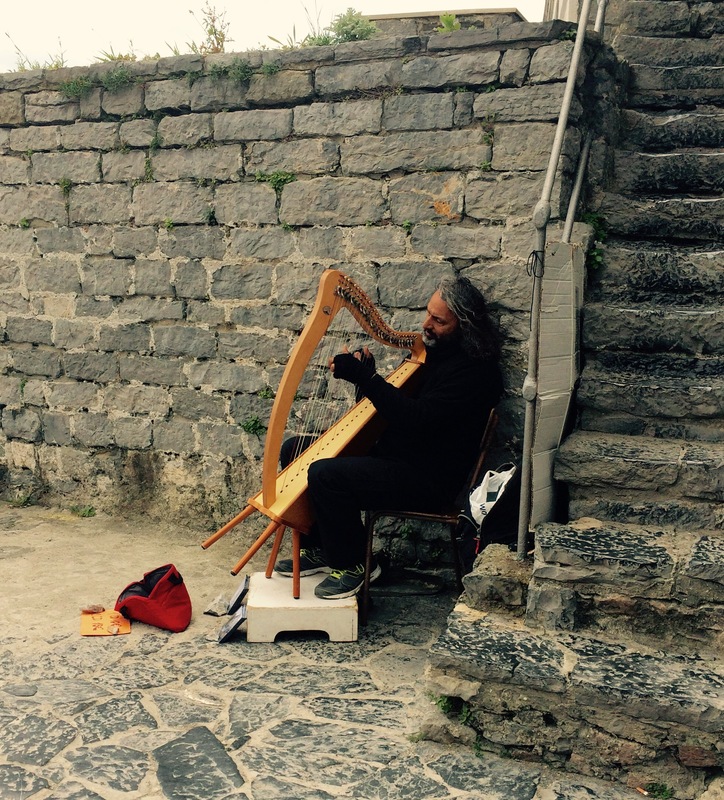 A man sits in a corner outside, his back against one wall as he strums a Celtic harp. He has disheveled long graying hair and a few days growth of beard. Dressed mostly in grays with a scarf draped around his neck he manages to look distinguished, artistic and oh so Italian. He has CDs for sale. I chat with him for a few moments about which I may prefer. We decide on the solo album. We continue to wander the cliffs of Portovenere, walking up even further, through the steep hills of a residential area. Doorways, steps and windows bursting with color, adorned by flowers and plants. It’s quiet. At the top of this hill is another church. This one, Romanesque, constructed in 1098. We just don’t have this kind of history in the states. After taking it all in we head back down to the water to find a place to eat before venturing on to the next town. There is a row of restaurants right on the water. We choose one closest to the ferry stop so we can bolt to it if necessary. It’s never really clear how long food service may take. One of our group is covering her eyes from the sun when a restaurant employee hands her a baseball cap with the restaurant name on it. He will later insist she keep it. We enjoy our lunch of caprese salad and white wine, absorbing the essence of this giant rock. Just as we begin to relax it is time to hop back on the ferry.